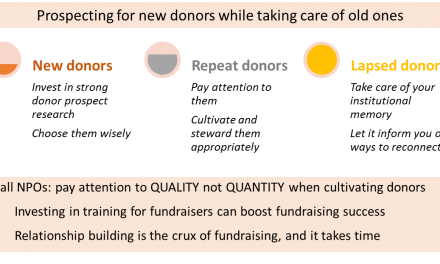 Solicitation is one part of the fundraising process, together with prospect research, building relationships with potential donors (cultivation), and maintaining relationships with donors (stewardship). The most effective way of raising larger sums of money is having a personal interaction with a possible donor. If the prospect is already aware of your organisation and has built up substantial confidence and trust in it, then it is time to raise the issue of financial support. 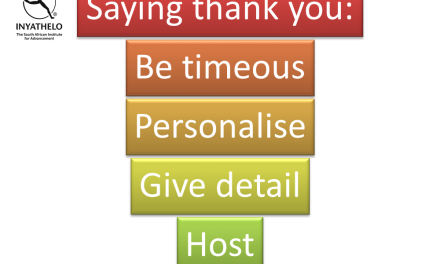 A personal meeting is more likely to secure this support than writing letters, telephone calls or general appeals. Some donors do not want to have meetings and ask for a written proposal instead. In South Africa, corporate offices often receive about 400 proposals a month. This shows how competitive it is to raise money when you have no relationship. Donors hardly ever donate money based on only a written document. So the proposal should be seen as part of developing and reflecting an agreed relationship with the donor, and thus the proposal ideally follows cultivation and a meeting with a prospect. In a mass direct mail campaign you send the same letter of appeal for funding to a large number of people whom you don’t have a relationship with. Often these lists can be supplied by or bought from big companies. Mass mailing means sending out several appeals a year and tracking the possible new donors in a data base. You will need to bring in a consultant to establish a direct mail system and to train staff how to do this. Letters of appeal are an expensive way or raising money and often your NPO does not recover the cost of investing in the mailing for a year or two. Your organisation can build solid relationships with the media and arrange for a public appeal in the newspapers, or on radio and television. On the internet, for example, through a social networking site such as Facebook. Through a poster campaign, for example, putting up posters in community shop windows, schools, churches and libraries. PreviousWhat is the Donor’s Bill of Rights?